Comments: The black-capped vireo has not been confirmed in Kansas since 1953. However, it once nested in the Red Hills and was considered common in Comanche County by N. S. Goss in the “History of the Birds of Kansas,” published in 1891. 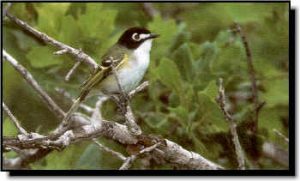 This rare bird is more likely found further south in low, brushy country with deep ravines, scrub oak ridges or chaparral in Texas or Oklahoma. The black-capped vireo suspends its nest 2-15 feet high in forked branches of a plum, dogwood or small oak. Like the Bell’s vireo, the black-capped vireo is known to suffer a high incidence of nest parasitism fromthe brown-headed cowbird. One of the management strategies to increase nest success is to trap and remove cowbirds.